Created just ten days ago, the Ukraine Crisis Media Center is already helping Ukraine's new interim government get its message to the world's media and counter Russian claims about the country. 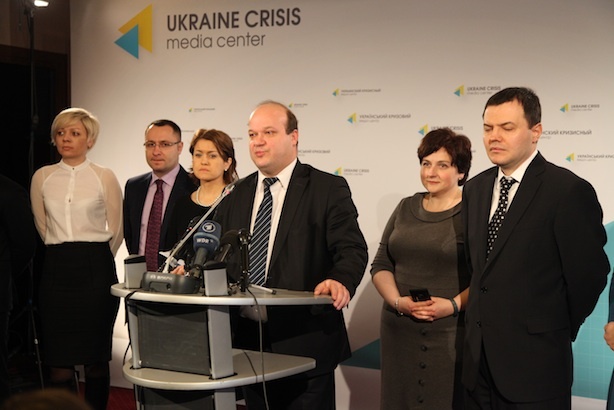 I first heard about the Ukraine Crisis Media Center on Facebook, shortly before travelling to my native Kiev last week. It was my first visit since the incredible events of the past few months, which were punctuated by massive rallies on Kiev’s main square, bloodshed, President Viktor Yanukovych’s exit, and then the military occupation of Crimea by Russia. Each of these on their own would be a big challenge for any communications executive, but in Ukraine, they have to be dealt with all at once. Seeing that a communications operation was needed to respond to those events, the team is based just around the corner from the center of Kiev’s main square, where flowers and candles mark where dozens of people died. "We could not carry on business as usual. Within 48 hours, the Ukraine Crisis Media Center was born," Yaryna Klyuchkovska, one of the 15 experienced comms executives behind this initiative, told me. "None of us working here seeks any personal dividends from this," she added, explaining that the center’s staff has to combine this volunteer work with their main salaried jobs elsewhere. Dozens of public relations professionals have answered the center’s call for volunteers, and several journalists, photographers, and interpreters have joined them. I visited the center’s media room, where the floor is given to key newsmakers such as government officials, diplomats, experts, businesspeople, artists, and community leaders. The hunger for information in Ukraine is huge, so the Soviet-style hotel housing the operation was buzzing with activity. News updates and info sheets were being prepared, translated into several languages, and circulated to more than 1,000 media outlets worldwide. A team of fixers was on standby to assist crews of foreign correspondents and the best interpreters were offering their services for free to help with press conferences. The center’s primary objective is to help Ukraine’s government get its messages across and, in particular, to refute Russian claims about its illegitimacy and alleged "chaos" in the country. As a result, the coverage has improved. Statements from government officials now get aired by the major news networks and appear in print. TV stations such as CNN are using the Ukraine Crisis Media Center for live video broadcasts. After just one week of operation, the center has become a first port of call for many foreign journalists in Kiev. "It’s been really impressive," said Andreas Weise, a journalist from ZDF, the German national TV network. "The center has proved to be very useful for us, as it offers an easy access to key newsmakers." I met a dedicated team preparing targeted messages for the predominantly Russian-speaking east of Ukraine, where Russian TV is fighting to sway public opinion in its favor. Its coverage is in stark contrast with that of the Ukrainian media, and the team is working on ways of countering the stream of misinterpretations about the situation in Ukraine that Russian TV is pouring out at its audience. There’s an even harder task at hand: the complete isolation of now occupied Crimea, with all Ukrainian TV channels broadcasting on the peninsula now shut, and journalists from mainland Ukraine getting turned away, threatened, or even beaten. "We are reacting to the situation as it unfolds," Lena Lobova, a team member, explained. "We had printed leaflets warning the Crimean people about the consequences of annexation and sent them with two of our activists. Just before entering the peninsula they were detained by the Russian forces but have now been released." Another team member, Vasyl Myroshnychenko, explained that "we are constantly on the lookout for credible sources in Crimea, who can tell the world about what is happening on the ground." "For example, we managed to get hold of the ambassador of Lithuania, the only diplomat from a European Union and NATO country present in Crimea that was able to report the most recent findings directly to international media," he said. Klyuchkovska told me that the people behind the center are determined to continue the effort while the situation remains critical. "We do not know how long we will be able to hold out. Eventually, the center will need to be reorganized into something more stable and sustainable. But for now, we are at war. Until it’s over, we won’t wrap things up," she said. Marina Denysenko is a Ukrainian working in PR in the UK.